Platinum Art Deco Sapphire and Diamond Trilogy Engagement Ring — Form Bespoke Jewellers Ltd.
A beautiful Art Deco engagement ring, cast in platinum and set with a sapphire and diamonds. The bold shapes of this engagement ring are what make it so unique. 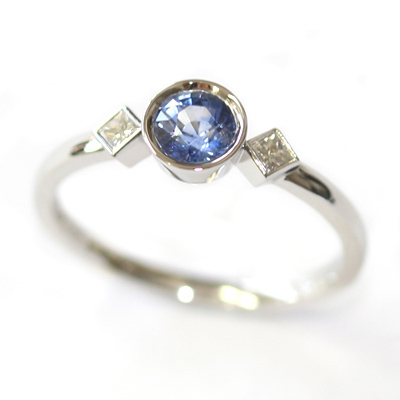 At the heart of the trilogy design is a bright blue, round brilliant cut sapphire. A pair of matching princess cut diamonds flank the sapphire and all the stones are rub set for a tactile finish. For a stylish twist, the princess cut diamonds are set on an angle, taking on a diamond-shape rather than their usual square. The customer chose for the ring to be cast in platinum which complements the cool tones of the trilogy beautifully.